The second use case focuses on unreliability of the connection to the cloud. 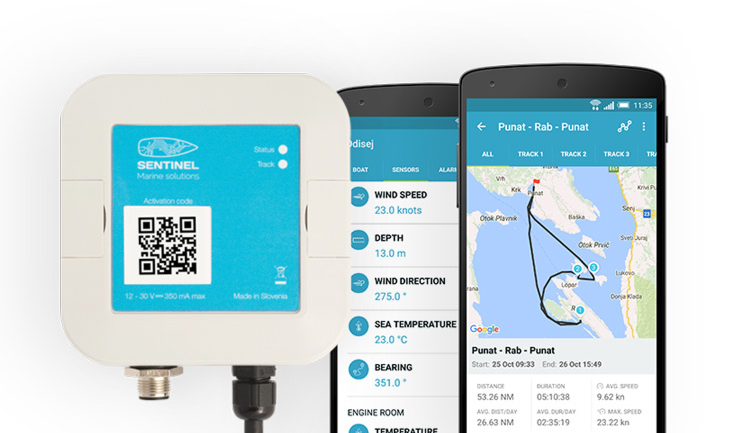 Sentinel devices (http://www.sentinelmarine.net) are advance vessel monitoring sensors capable to inform the user or owner with all relevant data accessed on the boat. The vessels do not have reliable communication link to the cloud and therefore mF2C platform will be tested against this specific environment. The Sentinel devices are deployed mainly in the Adriatic Sea, aiming at improving quality of the sailor’s journey. As of today Sentinel devices work in an isolated way, hence losing the potential benefits brought by correlated data processing. As a product evolution, the Sentinel device is in constant design loop of adding novel services enriching the Sentinel portfolio. However, most of the ideas for innovative services require the missing data correlation but also additional capacities such as interaction with external data, etc. Recognized that F2C as the suitable computing technology for Sentinel to be enriched with new services, including the opportunity to use predictive models as well as the interaction with other open source databases, the management framework proposed by mF2C to appropriately orchestrate F2C resources is a must. The main aim is to use mF2C to improve the Sentinel application more flexible in sense of communication routing and resource sharing.